I have finished my February Bead Journal piece. I started out wanting to do something with these neat looking tiger-eye rock chip beads. I just love the browns and golds in the stones and initially thought I would try to make a bison out of it. Why a bison? Well, here in Ann Arbor we have Domino’s Farms up north of the city. It’s an office park, but they also have a petting zoo for kids and herds of other animals, including bison. The bison are out grazing everyday in the pastures surrounding the office park, so at least once a week this winter, when we are out and about, we swing by to see the bison herd. My 2 1/2 year old loves it and it’s one of our favorite things to do – and it is easy for me since she and our 6 month old are all cozy in their car seats. So, I tried seeing how I could make a bison out of these stones and actually had a lot of trouble, so I abandoned the idea. I just started sewing on the stones in a sort of swirly S pattern, as I apparently tend to like, and outlined it with some gold beads. 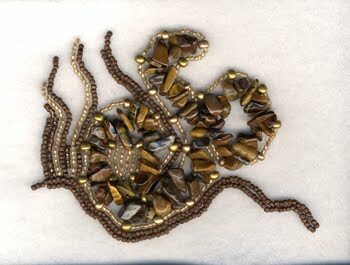 I also had some nice matte brown seed beads, so I added a few of those, thinking that I would just add some variation. No idea where it was going. Well, the funny part is that my 2-year-old, who likes to see what I am working on, saw it and turned it around and said, “it’s a horse”. I flipped it upside-down and wouldn’t you know, she was right! I realized that it actually was starting to look like a bison – talk about the subconscious at work and the beads telling me what they wanted to be! So, I flipped it around, took out some of the brown line of beads and did what I could to make it look like a bison. It was sort of ‘standing’ on a downward slope, so I left the whole piece a little off-kilter. I think it turned out rather well, considering I didn’t have a plan when I began. I wanted to leave the main S-curve of stones since that’s how it all started (didn’t want to edit it too much.) So, it may look a little crooked, but I love it. I used some of these pearly off-white seed-beads to add some snow to the ground and flakes in the air. All in all, a very interesting experiment and something that really journals a part of my life with the girls this winter. Hope you enjoy it! Previous January Bead Journal – finished! carol, what a neat piece! i really love the stones and the colors you used. wow, pretty amazing for not having a plan…it sure did turn out just like a bison! what a great journal piece to share with your kids when they get older. it will remind them of their outings to see them with you, i'm sure. I love how your daughter said it looked like a horse! Little ones are so amazing. Your piece is beautiful. I love everything about it. Your representation of textures is perfect. Can't wait for next month. Beautiful! It is a little like ancient cave paintings of animals — very strong and fluid. You used the perfect colors and textures to convey the bison's strength and calmness. You liked your January piece better turned over, too. Maybe that's how your mind works with the beads…? Anyway, wonderful piece! Very evocative work and a great example of following your muse. I am with lois! It reminds me of cave paintings! Very Cool! I see a bison. I think your piece turned out great! And I also see the bison!! congrats on a fine piece! Thanks for your feedback, everyone! Glad you see the bison, too 🙂 And I can't wait for the next piece, either. I have no idea what it will be! Lois – I'll definitely keep the upside-down thing in mind. Or, perhaps I shouldn't and it will just work out that way! I love your story behind this piece, thank you for sharing 🙂 How great that the beads decided to give you a bison anyway. It does remind me, too, of the cave drawings etc. I think you did a great job, wonderful beads, and really love how the piece turned out. It's funny, Carol, before you even said anything about what your daughter said, I could see an upside down creature in your first picture. I really like this piece a lot. It's very earthy – and I'm an earthy person (maybe that's a Capricorn thing…). And I thoroughly enjoyed reading the story behind your beads! This is great, Carol! Using the chips was an inspired idea. Looks like it was carved out of stone. Carol, I love it! You're my kind of beader, just let the beads tell you where they want to be. And don't you just love it when you turn it upside down and the "real" picture appears! Sure do like it and it does indeed look like a bison. It reminds me of prehistoric cave-paintings so I think you are in very good company!Isn't it marvelous that if we just bead away our minds just have a way to create what is within us? What a neat surprise to find what you had done without know it! That's the part of improv beading I love the most. This piece is very impressive! Carol, Oh yes! the Bison was there all the time, you just needed to let him out! Very cool & the use of different types of beads really makes the piece. I really like it! It reminds me of ancient wall paintings in the Southwest as Lois, Terri, Whytefeather and others said too.Debi W.
Carol, your bead work has the same attention to detail that you had in your drawings. Sounds like you are really enjoying this new craft and the results look lovely. Thanks for all the additional comments! I love the comparison to a cave painting. Cool! @Robin – yes, I wouldn't have thought to create a bison like this if I did it intentionally. That's why it was so fascinating to me that it turned into one! Loved hearing that your Rosie was the same. Oh, how COOL! I loved the abstract nature of it, but it really conveys the feeling. Wonderful story, too. Great work! 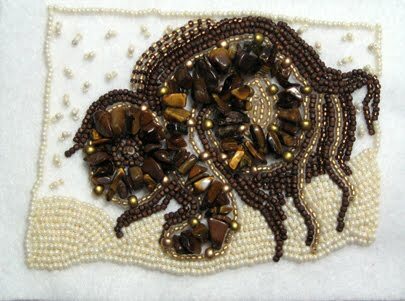 Fabulous, I love your bison, wow, to not knowing where you were going with the beading when you started this project….gorgeous!! Ha! Very very cool. I love the way your bison evolved and the way you gave him a place to be. Excellent! Thanks again to everyone for your comments! I'm still plugging away at March – I think it won't be nearly as interesting as February, but we'll see how it turns out. It's a really neat bison. In the first picture before I knew where you were going with the story, that's just what I saw. Good for your daughter to put you back on track. I'll bet she likes the bison more than a horse!